Yesterday morning I woke up and put my bread in the toaster, ready for some crunchy peanut butter toast. But, when I opened the jar, I saw that I only had one piece of toast's worth of peanut butter left, and I had neglected to pre-butter my toast for jelly. "What's a spinster to do," I thought. And then I realized: I had an unopened jar of Speculoos just waiting to be consumed. Every morning when I get to work, I look at about 16 blogs to get myself going. The list contains a bunch of different design-related sites, and more than one of them has recently mentioned cookie butter or speculoos. Some even had recipes. I had no idea, though, that this would be available pre-jarred. Then, I was at Au Bon Pain one saturday for a chocolate croissant (why else? 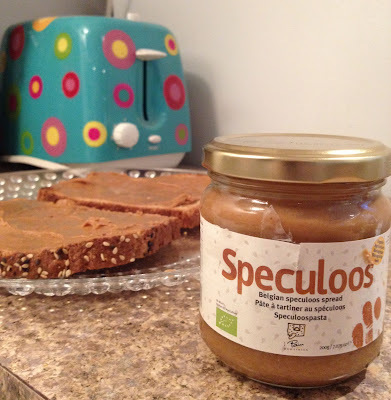 ), and I saw they had a jar of - was that - yes, I think it was- Speculoos!? Oh, it was, and I tried it. And I told the cashier, "I'll take some of that, too." For those of you who have yet to try the deliciousness that is cookie butter, the jar I bought, when applied to toast tastes something like spreadable teddy grahams. In other words: delicious. For me, this discovery amounts to the greatness of the first time I had Nutella. In case you're not jonesing for some speculoos, and you're worried you might not be able to find some, not to worry! Trader Joe's has their own kind, and a search on Amazon turns up quite a few results. I would imagine Whole Foods also carries something of the sort. And if you're across the pond, well, I suppose you won't have any trouble finding it at all! So get yourself some speculoos, and have a happy friday!